Welcome back. First, I must apologize for being absent for so long, but I’ve been busy editing the new book, getting artwork approved, and trying to promote my crossover petition. And in that sprit, I wanted to talk about something that is rare in popular writing, but does happen on occasion- the crossover. 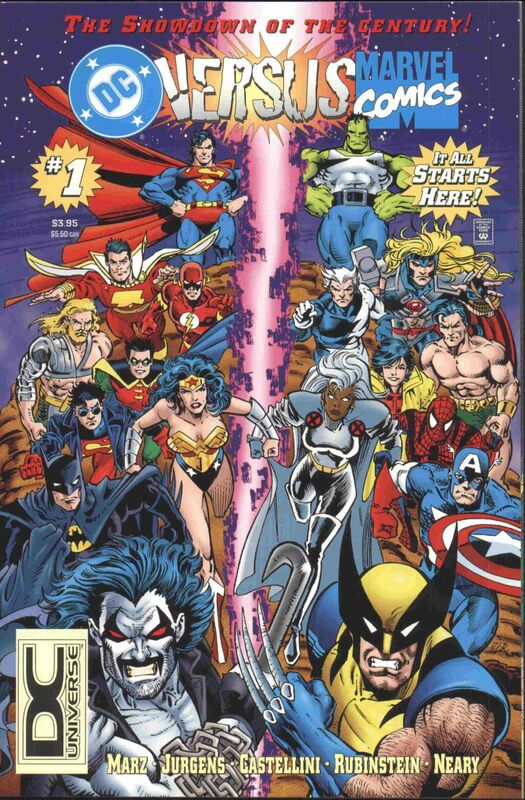 In the simplest terms, a crossover is combining characters from two or more existing worlds or franchise in a single story. In general, these are rare occurrences, due to both creative and corporate reasons. Creators themselves can be wary of combining their stories, and with the vastness of property ownership, being able to get through all the legal issues involved can doom a project from the start. However, they still have happened in the past, in films, TV, and comics alike. Sometimes it can combining two franchises under one corporate umbrella (the horror classics of Universal’s Frankenstein meets the Wolfman, and New Line’s Freddy vs. Jason) or two companies making a mutually profitable venture ( the DC Comics vs. Marvel miniseries). But regardless of the origins, writes of these stories must obey the fundamental rules in order to make it work. #1. It Has to Make Sense- while this rule seems obvious, it is one that needs to be remembered. While certain characters are believable together, there needs to be a legitimate reasoning behind why they are working together. The set up is all important, or else it’s mindless fanservice. For example, in the DC/Marvel series mentioned above, the “God’ figures of the Marvel and DC universe are going to war, and the two sets of characters are set to battle to determine superiority, as a battle with the two godheads would wipe out all existence. It gives the heroes a good reason to fight despite their moral misgivings, gives us clean one on one battles, and a big enough force to bring two universes together. #2 Two Franchises, Two Rules- every story has a set of rules and regulations for it’s universe and characters. Therefore, bringing them together means these rules have to be obeyed. In Alan Moore’s League of Extradinary Gentlemen, arguably the greatest crossover ever, we have numerous literary characters joining forces. One character is Captain Nemo, who was well established as disliking humanity for it’s sins. Therefore, in the story, he demonstrates moral outrage at the vicious ‘punishment’ of the traitorous Invisible Man by Mr. Hyde (who is also acting in accordance to his rules, haven grown more evil due to spending more time as Mr. Hyde) and abandons the group when they are tricked into bringing a deadly virus into alien infested London. Even the Invisible Man works according to his rules, becoming more and more untrustworthy as the story progresses. #3 The Characters Have to Mesh (or not)- this is an expansion of the previous rule concerning sense-making. When two characters are brought together, they need to have similar enough traits that they could function together; a good example is the multi-planet, peace promoting Federation of Star Trek, and the similar-minded Legion of Superheroes. However, it can often be fun to bring together characters that are more opposite then alike, such as Batman and Spider-Man. Both characters are thought of as tragic and angst ridden, but deal with their pain differently- Batman projects a grim exterior, while Spider-Man cracks jokes. The interest them comes in watching the two characters find their similarities buried under their outward appearances. #4 No One is Superior- This is the most important rule of any crossover, which is why I saved it for last. The central idea of bringing two characters together is to show them working together as equals with mutual respect. Therefore, neither character can be shown as superior to the other, as it shifts the balance to that character and makes them, and their universe, feel superior. Some ways to avoid this are to highlight each character’s skills at different moments- Batman is more of a detective and is more intimating, but Superman has knowledge of alien devices and is more trusted by the public. Another way is to have the characters fight each other, but end in ties, or have each one win a single fight to highlight how each approach can work. But above all, you must do something to make sure your characters are on equal ground, or your crossover is doomed from the start.